Towards the end of the Kutztown University Old Order peoples talk, Ben Riehl made a remark–I’m paraphrasing here–that “the Amish and Mennonites are just a small piece of a much bigger Pennsylvania German story”. Pennsylvania German Cultural Heritage Center director Dr. Rob Reynolds has shared a little bit of that story with us today. The Amish and Mennonites were in fact only a small segment of the many thousands of Pennsylvania German people who immigrated to America beginning in the 17th century. 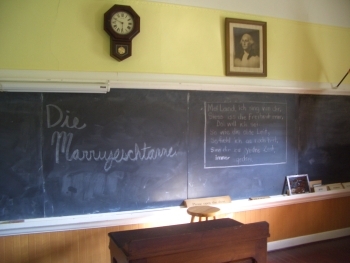 The Amish and Mennonites have grown in significance for Pennsylvania German society due to the fact that they are among the last to actively use and propagate the Pennsylvania German (or Pennsylvania Dutch) language. While Pennsylvania Dutch was once widely spoken among peoples in the region, outside the Amish and Old Order Mennonites, today mainly older generations know the dialect. The work of Dr. Reynolds and the Center includes promoting the Pennsylvania German dialect and culture. 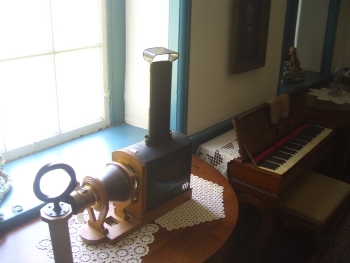 Last summer I had a chance to visit the Center, which included a visit to the on-site one-room schoolhouse and Pennsylvania German home, which you can see in the photos on this page. Thanks to Dr. Reynolds for sharing a little more about this unique and fascinating cultural group. Amish America: Can you describe the background and history of the Pennsylvania German peoples? Dr. Rob Reynolds: The Pennsylvania German culture that we know today is the result of a mass migration of ethnically similar peoples of Germanic descent. The vast majority of these immigrants came from the southwestern portions of what is today Germany including Rhineland- Pfalz, Württemberg, and Swabia, the Alsace-Lorraine region of France and portions of northern Austria and Switzerland. These people shared a common language, ethnic culture, and religion. Those leaving these areas went to other European countries, South America, and North America. The Pennsylvania Dutch left Europe for several reasons, some of which derived from religious persecution resulting from new ideas that developed during the Protestant Reformation, and because of a lack of land and opportunity present as the population grew during the eighteenth century and land became harder to acquire for the younger generation. Under an oppressive feudal structure in Europe, most farmers did not own their houses or even the crops they grew. William Penn’s promises of religious and personal freedom offered a chance to escape these conditions and presented hope that conditions could improve for immigrants and their children. In 1683 the village of Germantown was established by a group of Mennonites led by Francis Daniel Pastorius, and in succeeding years other groups, such as the Dunkards and the Moravians, settled in Pennsylvania. The Anabaptist groups of the Amish, Mennonites, Dunkards, and Brethren were conservative separatist Protestant Christian sects that left Europe to practice their religious convictions. The vast majority of Pennsylvania Germans were Lutheran and Reformed church members. The bulk of Pennsylvania Dutch immigration occurred after 1710, when the Germans from the Palatinate first arrived. Many of these people had sought economic and religious freedom in England; from there a number were sent to the Hudson valley to engage in the production of naval stores, but with the failure of that project many Palatines moved to the Tulpehocken region Berks County Pennsylvania. Enthusiastic written accounts of the opportunities in America brought other settlers from Germany with over 80,000 immigrating before the American Revolution making Pennsylvania approximately one-third German at the time. The Pennsylvania Dutch helped settle and clear the vast frontier during the 18th century. The earliest settlers of Pennsylvania were English and Swedish immigrants who had settled the best lands around Philadelphia. By the time large groups of Germans were arriving the best farmlands were in the frontier areas of what are now Berks, Bucks, Lancaster, Lebanon, Lehigh, Montgomery, and Northampton counties. These areas possessed the most open spaces; amble land; and most notably, similar topography, climate, and foliage to the areas where most Pennsylvania Dutch immigrants came from. From Pennsylvania the Germans followed the frontier into northwestern New Jersey, central and western Maryland, along the Shenandoah Valley of Virginia, and into North Carolina. The Pennsylvania Dutch that settled Berks County included the Palatines led by Conrad Weiser to western Berks and immigrants that followed the Schuylkill River from Philadelphia to take up lands on the frontier in the Oley Valley beginning in the 1710s and 1720s. 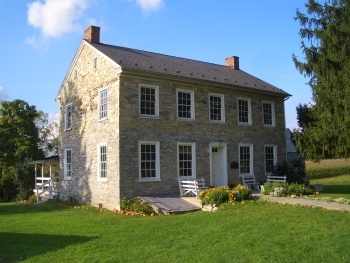 By the 1730s Pennsylvania German came over the Oley hills into the fertile limestone lands of the East Penn Valley that envelops the Kutztown area. In Pennsylvania, a group of six or seven families often owned as much land as an entire village in Europe populated by hundreds of people. The Pennsylvania Dutch sought the limestone soils of our region for its fertility and similarity to what they had known in Europe. Our topography of long relatively flat valleys sided by mountain ridges looks quite similar to the landscape of the Palatinate region. At first they took up lands, cleared the forest and built log houses similar in plan to continental European peasant three room houses. Over time the log houses were replaced with stone buildings reflecting a hybrid of influences creating an American style. Barns, uncommon until the 1790s, became larger over time as farming practices resulted in greater crop yields. 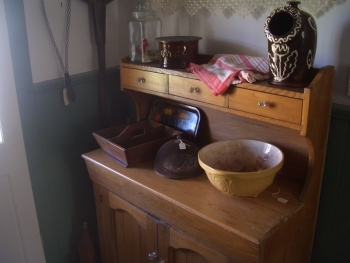 The rural lifestyle of the Pennsylvania Dutch fostered cooperation and the persistence of religious, language, and cultural traditions directly related to their European origins survived well into the twentieth century. Amish America: How many people of Pennsylvania German heritage live in the region? Dr. Rob Reynolds: The 2000 Census revealed a total of 108,060 people claiming Pennsylvania German descent lived within 100 miles of the Pennsylvania German Cultural Heritage Center. The 2005-2009 American Communities Survey estimated 141,653 Pennsylvania Dutch within 100 miles. This significant increase is attributable to a growing awareness of Pennsylvania Dutch ethnic identity. This growth in awareness is mirrored in the results from Berks County. In the 2000 census the number of people in Berks County that identified as Pennsylvania Dutch was 15,690, and in the 2005-2009 American Community Survey the number rose to 20,271. Amish America: What visible signs of Pennsylvania Dutch culture can we find today? Dr. Rob Reynolds: There are many signs of Pennsylvania Dutch heritage throughout Pennsylvania; however one will be hard pressed to find official state level Pennsylvania connections. After the death of William Penn, and continuing up until the early 19th century, many Pennsylvania Germans did not agree with the very English and Quaker controlled government of the colony and later state. Hence, you will find that there are no cities or counties named after Pennsylvania Dutch people. When one turns to the local level there are many indications of the Pennsylvania Dutch heritage. In Berks County alone, there are many townships and boroughs with Pennsylvania Dutch roots. Towns like Kutztown, Bechtelsville, Wernersville, Schaefferstown and Mohrsville are directly named for Pennsylvania Dutch settlers, while towns like Hamburg and Womelsdorf are influenced by the German settlers. Similar townships include Heidelberg and Muhlenberg. Even less obvious connections such as the township of Alsace are indicative of the Germanic French Huguenots who were among the Dutch. Throughout the county one is also hard pressed to find a town that does not feature some Pennsylvania Dutch road or street. In Kutztown alone we have Sharadin, Heffner, Stimmel, and Schaeffer. The landscape of our region largely resulted from the efforts of the Pennsylvania Dutch. The log and limestone houses, barns, and outbuildings, reflect Germanic traditions of craftsmanship. 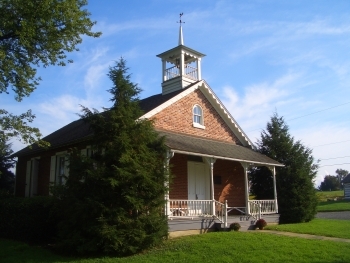 The churches of the plain and fancy Pennsylvania Dutch speak of the religious traditions. The open farm fields with hedgerows, orchards, fence lines, and other elements of the landscape reflect Pennsylvania German heritage. This is a very nice summary, Erik. I also like the photos. I believe the third one down shows both a melodium and a “magic lantern,” which projected images from glass slides on a screen or wall. They were very popular educational and entetainment devices. I catalogued a huge collection of glass slides in Ontario a few years ago. The slides were fragile, both for their material and for the emulsions containing the image. Not a great many survived the last 120 years! Magdalena in my visit and very interesting discussion with Dr. Reynolds I only scratched the surface of PA German culture. I’d like to experience the melodium and magic lantern in action. The home is fascinating. Tours are available but I believe by appointment only. I do think for people that know more about the Amish than average, they will know the factual side like you of course do, but there are some facts and figures and concepts you have to include that just have to be in every Amish film or book. OK. I give up. What’s the word on the blackboard? I’ve tried every German word combo I can imagine. Die Marriyeschtanne = The Morning Stars (in PA Dutch). It is the name of a band I perform in, this photo must have been taken right after the Heritage Center’s Harvest Fescht, where we performed. Wow Amanda, thanks for sharing that. I took this in what would have been mid-late September of last year. I am curious what type of music you perform. We perform traditional Pennsylvania Dutch folk songs with bass, mandolin, and sometimes fiddle. It was something that spawned out of our love of PA German Culture and history, as we both went through the PA German Studies program at Kutztown University. Can you purchase this music Amanda? I think you sparked some interest here! We have CDs for sale, but we are only equipped to do face to face cash sales. We have a Facebook page, but not much info there. If anyone is interested, email me and I’ll see what I can do, I’ll have to see if my band-mates have more CDs available. My email address is amandalynn0414@gmail.com. Thank you, Erik (& Dr. Reynolds) for this information. It’s interesting to learn why and how people emigrated to this country from various other parts of the world. 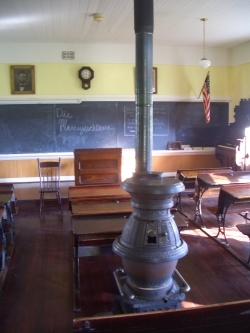 The photo of the schoolroom looks very much like one I took at the McHenry County Historical Society (IL) last fall. They have a one-room schoolhouse which they moved from a local rural area. This area was populated (1800’s) primarily by people from Germany (many Lutheran churches here), so it’s interesting to recognize similarities with other German “settlements” throughout the country. It’s especially interesting to me–my maternal Grandmother was born in Berlin, came to the US with her parents about 1904, and spoke German as a young wife/mother (according to the 1920 Census), but was married to a Polish immigrant.She eventually learned English, but I don’t think she ever really “mastered” Polish. She died when I was 7 or 8, and always spoke English to me. Erik: This is fascinating. Thanks. I imagine that WWI and WWII had a huge impact on PA German society. Undoubtedly people and whole communities did what they could to suppress any “Germanic” influence, given the sentiments of the times. I remember hearing an older relative comment that German was dropped from his town’s high school curriculum in response to World War I, and to this day is still not offered. While we certainly haven’t abolished the scrouge of warfare, perhaps we are becoming more erudite about languages. I understand that many more college students now that in past decades are studying Arabic. I’m also hearing about more and more elementary, middle and high schools offering bilingual or multilingual options. Little be little, we are realzing that language and culture are inseperably intertwined. Glad that the Amish have carried the torch to preserving the PA dutch language and culture.